Carpenter oak are proud to present an incredible opportunity to custom build your dream home. We have partnered with a local Kingsteignton landowner and are offering five prime plots, with outline planning permission for sale in the Teign Estuary. 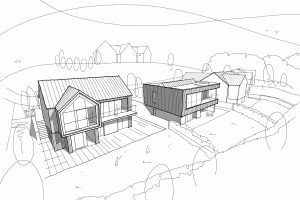 The plots will be part of a private gated development and benefit from an elevated position in Kingsteignton town on Vicarage Hill, with spectacular panoramic views towards Dartmoor. 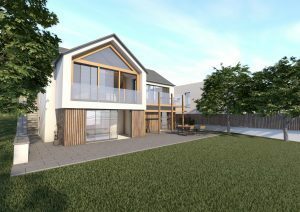 Perched on an exclusive elevated site in Kingsteignton, The Vicarage Hill development demonstrates luxury, environmentally responsive design. The layout responds to the specific site characteristics and maximises its advantages of exposure, southwesterly orientation and great views. Dramatic open plan living spaces showcase Carpenter Oak’s construction excellence in timber design and allow direct sunlight to flood your home, providing fresh, beautiful environments to live, relax and entertain in. With a plot and outline planning permission already in place, you are free to progress onto the next stage of your project. 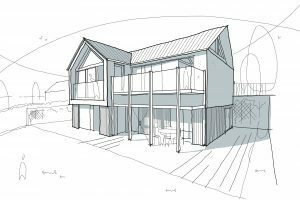 Our architects and oak frame designers will work with you to create your own detached, bespoke oak framed home. The size of your home can vary from 170m² to 200m²+, allowing you to build up to a five bedroom home. With over 30 years experience and expertise, we will help you navigate the whole process, helping you through all of the technical aspects of the design process. We use our experienced, reliable and skilled team in all of our projects. From groundworks to decorating, we will make the process enjoyable and straightforward, overseeing the construction of your home, every step of the way. Register your interest and sign up now to receive more information. We are arranging visits to the site where you will be able to see the plots and more detailed plans. Call us on 01803 732 900 to find out more or fill out the form below.